Some Kind of Spark is a feature-length documentary that follows six inner-city kids (ages 8-12) from the New York area as they embark on a life-changing experience—the opportunity to study music in Juilliard’s Music Advancement Program (MAP). Made over a 3-year period, the film intimately follows the students and their dedicated teachers, capturing the budding and profound relationships building upon every lesson. 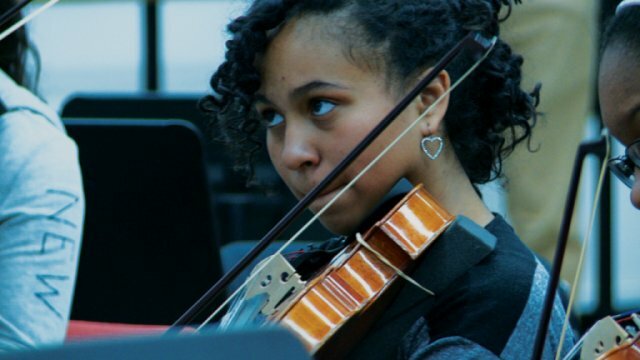 Some Kind of Spark is a feature-length documentary that follows six kids from all over New York City as they embark on a life-changing experience—the opportunity to study music in Juilliard’s Music Advancement Program (MAP), a Saturday outreach program for kids from communities that are underserved in the arts. Painting a deeply intimate portrait of the students' struggles to succeed in school and the program and patiently allowing them to tell their own stories, Some Kind of Spark illuminates the universal challenges faced by students and educators in communities worldwide: high poverty rates, low family literacy and weak school-family relationships. Spanning borders and ethnicities, gender and class, the film is uniquely positioned to quietly but effectively illuminate these pressing contemporary social issues. Throughout the course of the film, these kids go on a musical journey that is both inspiring and very challenging. This is a new world for these children—many of whom have never even heard of Juilliard—and the demands are high, even for beginners. They come from the far corners of New York City, from Sheepshead Bay in Brooklyn, Washington Heights and The Bronx, making the long trek, at times taking hours, as they navigate the buses and subway trains through rain and snow to reach the school every Saturday morning. There is a natural arc to the story as the film follows the kids through some of the most formative years of their lives—and in the early beginnings of their relationship with music and their teachers—over a 3-year span. In this time, each child has his/her own conflicts and hurdles to overcome. From a first recital and stage fright, to a lack of practicing and dedication, to a shortage of funding for an instrument. Ultimately, this is a film about transformation. It aims to serve as an inspiration for other programs across the nation to nurture two of our most valuable national treasures: our children and our musical heritage.